Image of the Week #28: "The Woman of Today"
I'm curious if the image of the woman on the right is indeed the "The Dress of the Hour for the Woman of To-Day." If so, I'm curious about what makes it the dress of the hour? The image on the right is curious because showing a women in a dress ringing a bell invokes the message of the dress of the hour. She's ringing the hourly bell in her new dress. However, it also denotes a sense of freedom as her outfit also seems to evoke a revolutionary garb and the most famous bell, the liberty bell, being run. 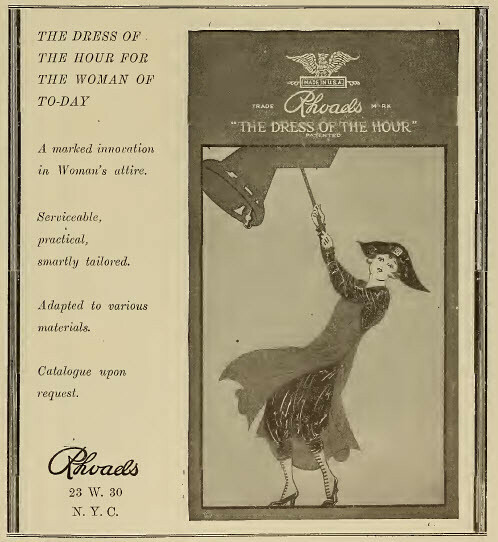 The image captures both of these ideas while the ad also reports that the dress is "serviceable, practical, smartly tailored"-which hint at a freedom of movement for the modern woman.